Fifty years ago at the 1964 World’s Fair in New York, General Motors welcomed the public to its main exhibit, Futurama II. The massive, 230,000 square-foot exhibit proved to be one of the most popular displays at the fair, showing visitors visual predictions of a high-tech future where there are underwater cities and moon transportation. The fun predictions were mostly wrong, but if you break it down like GM’s Fastlane blog did, the automaker’s optimistic assumptions weren’t too far off. 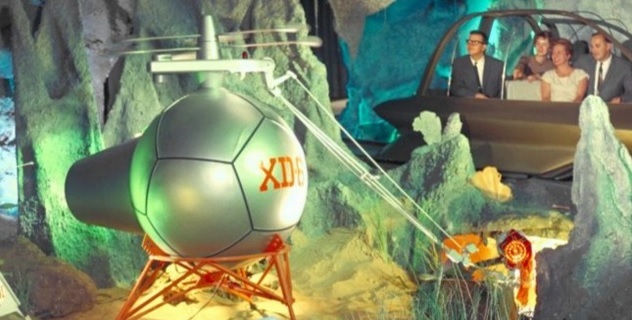 GM predicted that astronauts would be traveling between monitored shelters on the moon with a six-wheeled lunar rover. We might not have astronauts living on the moon, but we do have a rover exploring Mars right now, so really we made it further than we thought we would depending on how you look at it. GM did work with NASA on the original Lunar Rover, which is still on the moon today, and they collaborated once more to create Robonaut II, a humanoid robot which helps with daily chores on the International Space Station. GM predicted that a cross continental highway network would be built, enabling us to live wherever we please with distance no longer being an issue. Electric vehicles would also allow people to safely come and go to city centers for commerce and communication when needed. Today, the closest we’ve gotten to a cross-continental highway system is offering cars like the Chevrolet Volt, which offers 900 miles of range, making efficient long-distance transportation a possibility. Super highways would feature fast travel routes which were safe, swift and efficient. It was intended as a solution for traffic congestion, which we haven’t quite arrived at yet. Either way, Cadillac and other companies may soon have semi-automated driving systems which would ease the driver’s workload on freeways by adapting the speed of a vehicle based on the flow of traffic. One of the more outlandish predictions made was the possibility of underwater farming and harvesting, which apparently would have allowed for the production of enough food to feed seven times the population of the earth. Technology was also said to figure a way to convert sea water easily into fresh water. We’re nowhere near doing anything like this, but we have come to realization that we need to preserve our resources for future generations. GM is trying to do its part, cutting water consumption by implementing conservation tactics at its plants and aiming for a 15 percent water-intensity reduction by 2020. GM predicted the world would unite in weather stations in Antarctica that could transmit data around the world in moments. We’ve trumped this prediction by a wide margin. We now transmit data around the world in fractions of a second from a device smaller than a calculator and we don’t need to be scientists in a weather station in the arctic to do so. Taking it one step further, GM is developing vehicle-to-vehicle communication and vehicle-to-infrastructure methods that allow vehicles to share real-time information on speed, weather, traffic and other important aspects of driving. This would, in theory, reduce the risk of accidents and mitigate traffic congestion. I remember reading about the World’s Fair, but I was living outside of New York and never could see it, yet my Grandfather worked at one of the food stands there. I did visit what was left in 1969, and later in 2009, and saw many documentaries of the Fair. The Unisphere and the miniature New York City model are still there (the model was updated with the new One World Center tower). They predicted by 2008 we would all live in silver soccer balls.